It wasn’t so long ago that whispers of doubt were starting to swirl around Marcus Rashford. A bit-part showing at the World Cup was followed by an indifferent start to the season under Jose Mourinho’s negative Manchester United, and grumblings about the 21-year-old’s form, opportunities and place at Old Trafford were gradually becoming louder. Pundits were dismayed and United fans were fed up – the player long touted as England’s next golden boy was tipped for a move away from the club. Two months later, and everything has changed. Rashford is leading the line in Ole Gunnar Solskjaer’s revolution and looking every bit like a Manchester United number 10. Finally being afforded a a run of games in his natural position, Rashford is delivering on his early promise, scoring five goals and registering five assists in his last nine Premier League games. The kid is stepping up. Much like his new manager, Rashford has shown himself to be a man for the big occasion. The club’s recent training camp in Dubai has proved particularly beneficial, with Solskjaer claiming that the camp “prepared him for moments like that”, when discussing Rashford latching on to Paul Pogba’s pinpoint through ball and producing a game-winning finish against Spurs on the weekend. 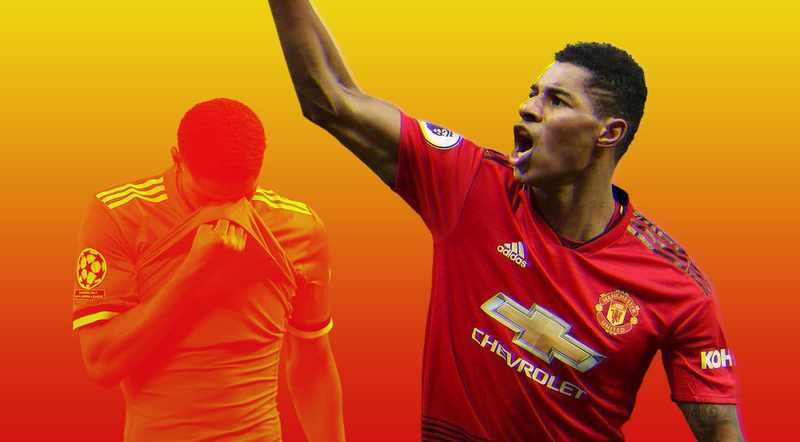 Having already scored against every top six side and slotting home derby-winning goals against Liverpool and career-ending finishes against City, Rashford is now putting together stats that illustrate elite-level consistency. It’s clear to see he’s enjoying his game much more under Solskjaer’s tutelage, having scored in three games back to back for the first time in his career while leading United’s revitalised attack. While the same fickle fans that once demanded him to be sent out on loan are now waxing lyrical about the United academy graduate, the dialogue from the media is also changing. Gary Neville labelled Rashford “United’s number one” after the Spurs game, with Robbie Keane even comparing him to Thierry Henry, “when Henry came here you weren’t sure if he was a striker, if he could finish. He was playing on the left and right wing. He had genuine pace like Rashford but now he is playing as a number nine”. United have now won six out of six under the new regime, and the club’s turnaround in fortunes resonates with Rashford’s resurgence. A top-four finish once considered out of the question is now well within reach, while the likelihood of Rashford leaving on loan has gone from paper talk to completely inconceivable. Another exciting change in narrative will come into play in February, when United take on PSG in the Champions League. United fans once dreading a humbling to the Parisians will now be counting down the days to February’s tie. Under Mourinho, the result of the tie was only going to go one way, but now a different prospect lies in waiting; two, top-heavy sides going blow for blow, with two young ballers in Kylian Mbappé and Marcus Rashford leading from the front. They are two very comparable players; both are in their early 20s, both are big game players, and both represent the new age of high-skill, high-intensity, high-quality football. While you can expect to see an end to end game in next month’s fixture, the most exciting element of that fixture will be watching two mercurial talents in the form of their lives going head to head in their natural habitat – big games. And Rashford’s success isn’t just good news for United. 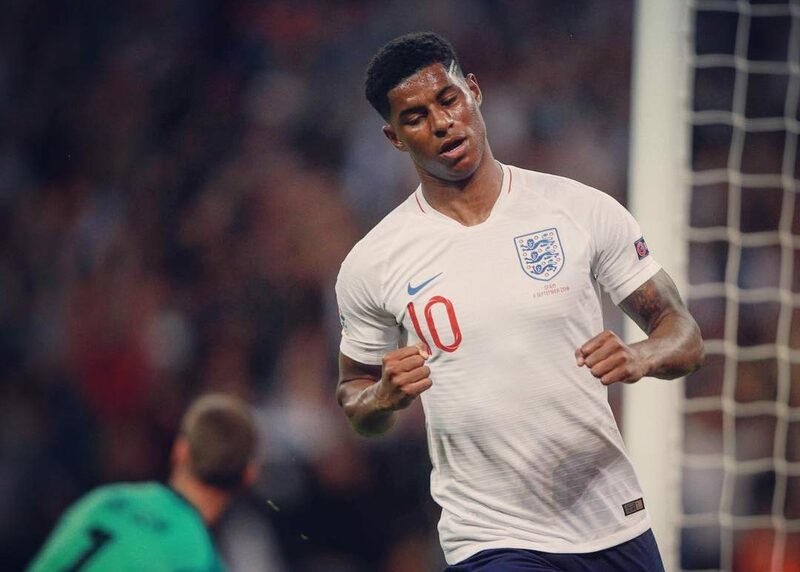 Before Jadon Sancho, Reiss Nelson and Ryan Sessegnon put the whole world on notice in regards to the limitless potential of England’s next generation – Rashford was the first baller to let tired England fans dream of a different future. His breakthrough was next level, stepping out of the shadows to score four goals in his first two senior games – including a brace against Arsenal on his Premier League debut. It was a seismic introduction and within six months he’d become one of the biggest prospects in Europe. If Rashford failed to capitalise on that bright start and became yet another player finding his opportunities in the Premier League limited – which you could see happening under Jose Mourinho – it would have been a blow for young and talented English players everywhere. His revival gives even more belief to the Young Lions, and shows the world this wave of England players are cut from a different cloth. With a potentially world class forward line of Rashford, Sterling and Kane leading England into future tournaments and several Young Lions already making their mark on big, European stages, the future of the sport in this country is the brightest and most diverse it has ever been. Rashford’s success shouldn’t just be celebrated by United fans, but by everyone.